Risotto is one of those things I always heard was really hard to make. But once I watched someone make it, and how simple it is, I had to try it fr myself. In a saucepan, heat the chicken broth to a slow simmer. In a heavy bottom Dutch oven, melt 1 tablespoon of butter. 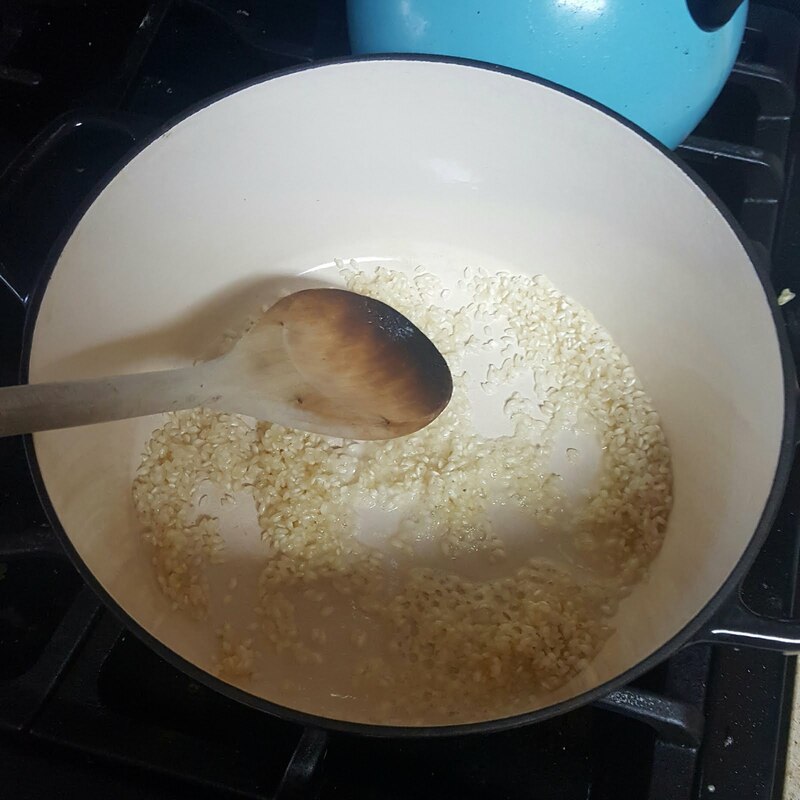 Over medium-high heat, sauté the arborio rice until translucent, or not quite browned. Remove the rice from the pot. Add the remaining tablespoon of butter. Sauté the onions and garlic until slightly browned. Deglaze the pan with the dry white wine. Return the arborio rice back to the pot and reduce the heat to medium. Season with salt and pepper. The next step is where it can get a little tricky. It's not hard, it just takes patience. 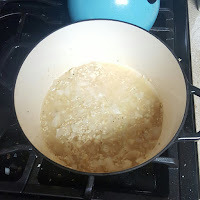 Add the chicken broth to the rice, one ladle at a time. The rice is going to slowly absorb the chicken broth. Don't rush it by turning the heat up too much or the chicken broth will evaporate instead of absorbing in to the rice. Stir the rice occasionally. As the chicken broth absorbs into the rice, add another ladle one at time. 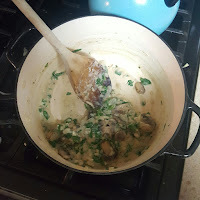 When the last ladle of broth has been added, add the mushrooms. 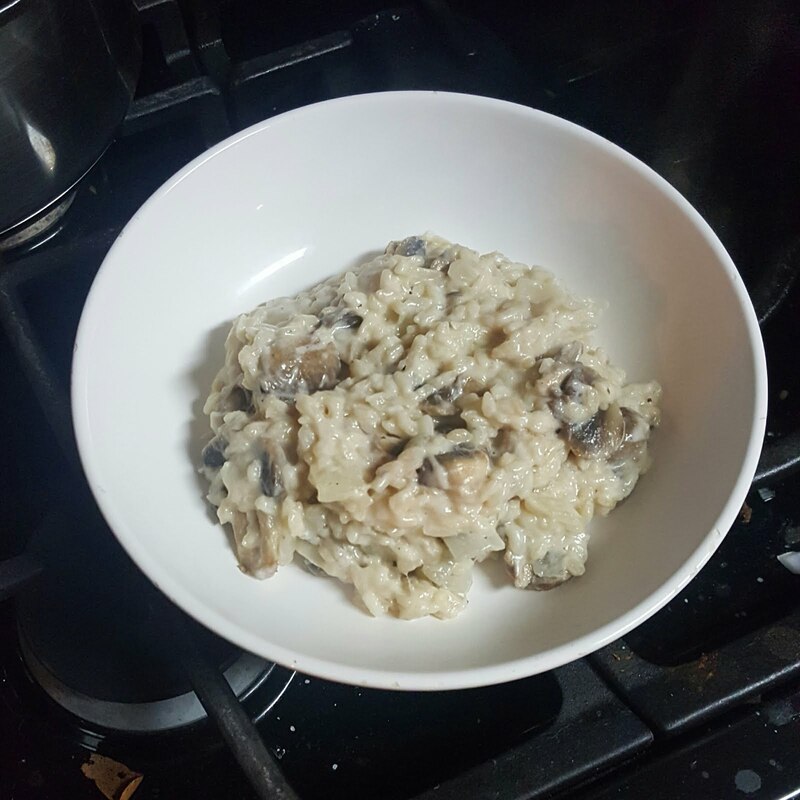 The mushrooms will cook quickly. When the broth is fully absorbed, the mushrooms are done. If you are adding the spinach, stir it in just before turning off the heat. The remaining heat in the rice will cook it. Remove the pot from the heat. Stir in the ricotta and mozzarella cheese. Some other variations to try are mushroom and asparagus, summer veggies, or pumpkin for the fall!